There’s a good chance that those following this blog are following, or at least interested in, events in Dimock, Pa. It’s hard to overstate the influence events in this small rural community could have on debate over the direction of U.S. energy policy. Here’s why: Dimock, in northern Pennsylvania, sits over one of the most productive sections in the Marcellus Shale. Cabot Oil & Gas, of Houston, Texas, is drilling and hydraulic fracturing hundreds of wells in and around the rural community with record breaking production. After a history of environmental problems and violations related to Cabot drilling, a collection of several dozen residents filed suit against the company for damages related to contamination of their water wells. Cabot is fighting the claims. Dimock is not the only place where residents have found problems with drilling operations or where water has gone bad. But events in Dimock provide precedence for local, state and federal policy makers. Local: Town Supervisors have denied an offer by Binghamton, New York, a city just across the border, to supply affected residents with water. There have been questions raised about whether these supervisors are illegally working behind closed doors with Cabot representatives. Meanwhile, agreeing to accept the water would establish that the township is facing a crisis that requires “mutual aide” from other towns, a class of problem usually associated with a hurricane. Dimock leaders, down playing the water and drilling problems, are growing tired of the bad publicity the town is receiving. 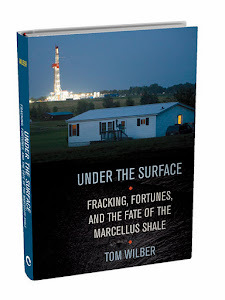 State: The prolific section of the Marcellus that runs under Dimock extends into the Southern Tier of New York. New York’s environmental review and ensuing drilling moratorium can be attributed in part to the high profile events in Dimock, which have made a significant part of the New York public suspicious of the immediate impact of fracking, the cumulative impact of the waste it produced, and the degree of transparency of the entire process. With all there is to cover with the shale rush that has created an onshore drilling bonanza, the story line in Dimock continues to provide high visibility tests for legal and public perception of drilling. For these reasons, I have featured Dimock, and contrasting events in the Southern Tier of New York as the setting and context for Under the Surface, to be released in a few months. But events here extend well beyond the regional geography. Landowners in central and western New York, if they are not already aware, may soon learn that they are part of the prospecting rush, too, as the Utica Shale becomes a target for prospectors. Shale gas plays are developing in Alabama, Louisiana, Wyoming, Arkansas, Texas, Colorado, Wyoming, and other places. Regardless of where the Dimock events lead to, understanding the political and social dynamics of the conflict through personal stories of residents on both sides of the debate, and on both sides of the New York/ Pennsylvania border, is important to understanding what is at stake not just for Dimock, but for the country.